If you suffer from Hashimoto’s, you are most likely taking a synthetic thyroid hormone (levothyroxine) every day. Unfortunately, it is not very clear to doctors how to properly handle patients with Hashimoto’s (my previous post). 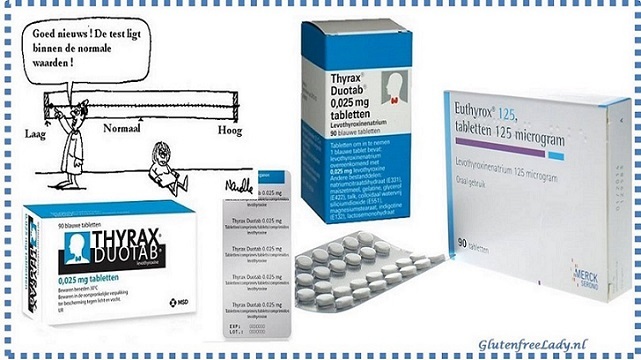 I have been taking Euthyrox (the form of levothyroxine available in Poland) for 6 months. Afterwards, I have switched (under supervision of my Internist in Rijnstate Arnhem) to Thyrax Duotab (the form of levothyroxine available in The Netherlands). 18 months passed and most of my symptoms remained. Besides, accordingly to the TSH blood tests I was prescribed higher and higher doses of the synthetic hormone. The longer I was taking the pills, the higher the dose that was demanded by my body in order to show the ‘theoretically’ correct hormones levels. Last year, I was diagnosed with iron deficiency anemia. From there, it was a fast road to the next diagnosis: Celiac Sprue. According to the Marsh Classification, I have a 3rd degree damage of the small intestine. That means that I am not able to produce the lactose breaking enzyme Lactase which is produced by the body cells present in the small intestine. I have been feeling nauseous every morning after taking Thyrax. I did a small investigation on my own and I found out that the available synthetic thyroid hormones contain lactose, milk sugar – the same one that most of Celiacs can not tolerate. Lactose can cause symptoms in newly diagnosed Celiacs who, next to the gluten intolerance, suffer on lactose intolerance. The worse is, however, that most of the synthetic Levothyroxine pills contain lactose. Today, my Internist prescibed me a lactose free levothyroxine supplement called Eltroxin. I haven’t picked it up from a pharmacy yet. 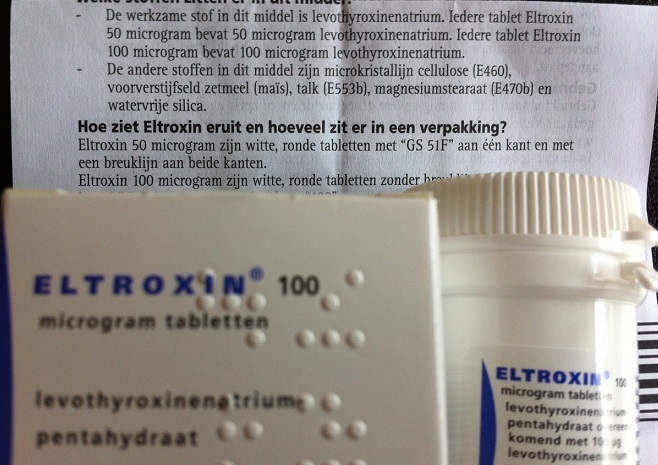 On internet, it is written that Eltroxin contains lactose. Now, I am worried. I will keep you posted once I check it in the pharmacy. An update: Eltroxin seems to be both- gluten and lactosefree. Another lactose free option would be the natural, desiccated thyroid which is powdered thyroid gland of pigs. This supplement is not approved by conventional medicine. Plus, not everybody reacts well to it. It contains both T4 and T3. Every batch seems to have a different ratio between T3 and T4 hormones which is logical – not every pig has the same biochemistry. But, pigs have a different ratio between T4 and T3 than people have. People need more T4 than pigs. In spite of all, some people do feel better after taking the natural thyroid hormones. Make sure to test yourself on lactose intolerance. It is very common for people with Hashimoto’s to have gluten and/or lactose intolerance. I hope that there will be a solution very soon! Hi JoJ, thank you for leaving a comment. This is very unfortunate for us. We do not have other choice, the medication is necessary. From what I got to know so far, there might be an option to contact Dutch pharmaceutic company and order a custom-made medicines. I haven’t found out yet if the insurance would cover the costs or it is something you need to pay for yourself. I hope to know more in the future.